March 9, 2019; 8:30 a.m.—6:00 p.m.; Check-in begins at 8:30 a.m.
You must attend the FULL day to receive credit for the course. COST $35 (includes book and lunch) Books will be mailed to you after paid registration. Please review your book prior to class. This course will include processes to help individuals discern and respond to God's particular call in their life. Each participant is encouraged to recognize and employ his or her spiritual gifts for the Church to become what God intended it to be. Participants will consider the importance of exercising servant leadership, developing future leaders, remaining rooted in consistent spiritual practices, and being part of a group that holds members accountable in discipleship. The textbook for this course offers guidelines for optimal communication in leadership and presents numerous types of ministries in which Lay Servants may assume roles. This UM polity course gives participants an overview of the structure and organization of the United Methodist Church. This course examines the connection between United Methodist polity and theology. This in-depth analysis addresses ways in which historical developments have shaped--and continue to shape--the organization of the church. The book is cross-referenced with the Book of Discipline and references to recent works on The United Methodist Church and American religious life. Participants need to bring a copy of the 2016 United Methodist Book of Discipline to class. Every church deals with conflict, both healthy and unhealthy, and lay servants can be equipped and empowered to help lead through those times of conflict as a time of transformation. Transforming conflict into a positive rather than a negative force is a spiritual pursuit and needs to be grounded in biblical principles: love of God, neighbor, and self. The course textbook is a resource for leaders, ministers, mediators, facilitators, and conflict transformation consultants who want to approach the work in this way. Part 1 explains how we can prepare ourselves for the work of engaging conflict. Part 2 explores how we engage others in conflict transformation, outlining specific processes. Interwoven with the practical instructions are stories that illustrate the potential for this new "justpeace" approach. Other districts periodically hold LSM training events. As we have information about these events, we will post the dates and brochure links below. If you attend any of these events, please bring a copy of your certificate for our records. At the 2016 General Conference approved legislation to bring about clarity, consistency, and collaboration in the LSM program. The adopted legislation streamlines and simplifies the processes for people to become certified lay servants, certified lay speakers, and certified lay ministers. In addition, the lay missioner will become a part of the Certified Lay Minister process. This will bring the number of categories to three: certified lay servant, certified lay speaker, and certified lay minister. The category of local church lay servant has been removed. A layperson can still serve in the local church after completing only the BASIC course, but in order to be certified as a lay servant he/she will need to take an additional Lay Servant Ministries’ advanced course. 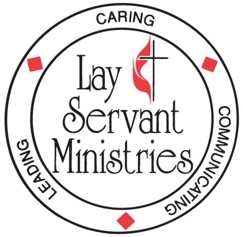 Lay Servant Ministries provides training and ministry opportunities for the laity of the church. The Southeast District holds a spring training usually in February and a fall training in October. There are now 3 types of Lay Servant Ministries: Certified Lay Servants, Certified Lay Speakers, and Certified Lay Ministers. Learn more about each one below or DOWNLOAD the adopted Lay Servant Ministries legislation. A certified lay minister serves to enhance the quality of ministry, much like a class leader did in early Methodism through service in the local church, circuit, or cooperative parish, or by expanding team ministry in other churches/charges. As with lay ministry in early Methodism, the certified lay minister uses his or her spiritual gifs as evidence of God's grace.